A short while back we attended a showing of a film at the Somerville Theater as part of the Independent Film Festival Boston. The director and main actor were there to discuss the film after the showing. Last night we had a very similar experience with a different film at our local favorite theater, the Regent Theater in Arlington. This film starred one of my favorites, Famke Janssen, best known to me and other fanboys as Jean Grey/Phoenix from the X-Men film franchise. In this film she plays a down-and-out pool hustler trying to get enough money to leave town with her son who lives in sole custody with her ex-husband. I really liked this film as it had a great indie feel with a solid cast and a great post-rock score by the Clogs. Famke and the writer/director Chris Elgeman were there for QA after the film. She was as beautiful in person as she appears on film and seems to be fairly knowledgeable about her craft. I hope this turns into a good dramatic breakthrough for her although some of the reviews from its wider release were not so great. This locally produced film premiered last year at the same festival. Last night we were lucky enough to have a viewing where Dave McLaughlin (writer/director), Lance Greene (actor/producer) and Bill Janovitz (writer of the musical score) were all there to discuss the film. Before the film showed we had the pleasure of a few acoustic numbers by Bill, who Stephanie and I know personally so it was quite fun. He even dedicated one of the songs to us! The film was a very good classic telling of the struggle one can go through when they find their muse. In this case it was told in the form of a Boston-based Irish-American played by Joey McIntyre (yes that one from NKOTB) and supported by a great cast that included another great local, Eliza Dushku. The Boston scenes were great especially one memorable moment on the T. The whole evening had great layers of self-reference and the basis of all of it in the classic Irish story-telling motif was perfect. 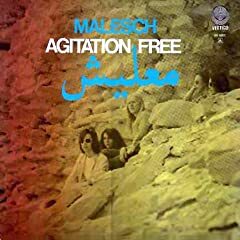 First on the NWW list is the band Agitation Free and the Audion-recommended release is their debut from 1972, Malesch. The band is an experimental rock band from Germany that I knew nothing about and that falls into the family of music called Krautrock. This album is a mostly instrumental release with a few over-dubbed vocal bits. This is a classic psychedelic jam with a pretty standard rock lineup of two guitars, bass, drum, and keyboards. Like many good jam bands the music is carried by very solid bass playing throughout. The influences vary from Grateful Dead space to traditional middle-eastern sounds. The varying styles can be heard especially through some of the percussion from Christopher Franke who went on to more “famous” ventures including Tangerine Dream, penning the Babylon 5 soundtracks, and, in that wierd way the world works, penning the soundtrack for the film I watched on my iPhone this week, "What the Bleep Do You Know". Some parts come off just like the instrumental jams the San Francisco bands were doing at that time, others sound like what has evolved into the post-rock of today. Good music and well worth the listen. edit – as DavidK points out, Cristopher Franke left Agitation Free before the release of Malesch. The drumming heard on the album is from Burghard Rausch. We watched a good documentary last night called Helvetica. It is on the surface about the history of the ubiquitous font, but once you get into it you realize that it is more about the people who are the typesetters, graphic designers and general font aficionados who care about things like the height of the ascending portion of your lower case d and how much white space there is in side the lower case a. For any armchair designer, this is a great look into the minds of these people. The font itself is both praised and vilified in this film and I think for the most part the criticisms are spot on. Some of the best quotes come from the naysayers in the film, especially Eric Spiekermann. I personally like Helvetica, especially when one wants to give a clean, well organized look to some text. Lastly the soundtrack , mostly instrumental post rock by El Ten Eleven, fit the clean feel of Helvetica perfectly. Stephanie and I share a single Netflix queue…I know you can have multiple queues on the same account, but we don’t. This week her latest choice arrived and it was a wonderful recent indie DVD release called Once. I really liked this film. It had a great story of a down-and-out street musician in Ireland longing for his lost love, finding his muse, and…no spoilage here but needless to say it is a very nice story. The thing that works so well for this movie is that it is very understated (a great contrast from my last pick, 300.) It was filmed on a very limted budget (I wish I was an investor on this one) and paraphrasing the director from the short "making-of" extra, for this film it was better to find good musicians that might be able to act than vice-versa. We both thought of the Hugh Grant / Drew Barrymore film Music and Lyrics where they took the opposite approach and the result was a "Lifetime movie". Once is told mostly through all original, (somewhat overly) emotional songs and a lot of single camera extended shots. This plus the great cast of very natural extras makes for another indie movie that really works for me. I am looking forward to getting the soundtrack to this one. Since the Red Sox were on the west coast this week end, the Saturday night game was a 10:05 PM EST start. This meant that as the kids were in bed by 9:15 we had some time to kill before the game started. Stephanie had recorded Glory Road on the DVR earlier in the week so we figured we would watch the first few minutes and then switch on the Sox. We would get back to the movie later…or not if we didn’t like it. Well we watched the film straight through and it was the Red Sox who had to wait for a later viewing. Glory Road is a based-in-fact story of the 1966 NCAA champion Texas Western College Miners (now called the University of Texas at El Paso) men’s basketball team, which fielded history’s first all African-American starting lineup of players to take a Division I national championship. Hall of Famer Don Haskins, portrayed by Josh Lucas, was the coach who “changed the history of college basketball” …this only two years after the passage of the Civil Rights Act of 1964. I knew nothing of this story until I heard Bill Littlefield interview Don Haskins and the author of the book that inspired the movie on his Only A Game radio show last winter. The story is full of moments where, unexpectedly, race becomes an issue for many of the characters, regardless of their skin color. I liked how a number of prominent, powerful white figures were shown not being overtly racist, but rather ignorant of the situation that blacks found themselves in that era. The cast was great and with the exception of a small role for Jon Voight, there were no big name actors. The soundtrack fits well with the era and was used both as background in some scenes and directly as part of the action in a few cases. While there is no new ground broken with this film, it is a great feel-good story about how pride and teamwork can overcome even the harshest of obstacles. The irony is that it is rare today to field a team in college or pro basketball that is not of a simliar makeup to that of the 1966 Miners. We watched Pieces of April the other night. This is a very good character-based indie film starring Katie Holmes and Patricia Clarkson (oscar-nominated role). Before you go off on Katie’s subsequent choices in a male partner and spiritual beliefs, check this film out. It is right in my “wheelhouse” with a cute punky female lead, a dysfunctional family, a road trip to NYC, and many uncomfortable holiday anxieties. Along with all that comes some very clever screenplay that makes you confront your own prejudices. All in a very good film…should be watched every Thanksgiving. It was time for another lockin at FPUU in Arlington this past Friday night. While the numbers of youth and adult advisors were greater than last year’s, the tone seemed much quieter. We played some rousing games of Sardines earlier than usual and I think that, plus the surprise dance party, sapped a lot of energy from everyone. The highlights for me were (1) jamming on the guitar with Eli, (2) sunrise sitting in the Tobey Lounge with the few youth who stayed conscious throughout the whole night (I slept from 1-5AM as I didn’t need to see V for Vendetta again) and (3) the games of Mafia in the Sanctuary. I sure hope the new leadership at FPUU will continue to support the Youth Group with as much care and respect. It is an incredibly enthusiastic group of youth who have truly exercised their empowerment to the fullest.